In honor of this day, Rupert Murdoch is promoting Guinness in a reverse psychology PSA. I had almost completely forgotten about stocking up today so, thanks, Rupert, for reminding me that Guinness is standing up for equality. 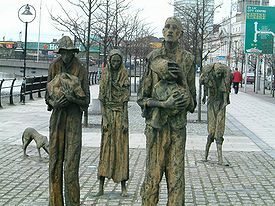 I can’t remember what free association web surfing lead me to the history of theIrish Potato Famine of 1845-1851. Some have referred to it as genocide. But it is a genocide of a peculiar sort, not necessarily motivated by racism. Maybe the resentment of the English for the Irish had its roots in the era of Reformation when the Irish stayed with the Roman Catholic church. Maybe it had something to do with Charles I using the Irish to quash his opponents during the English Civil War. Maybe Oliver Cromwell’s brutal revenge on the Irish had something to do with the punitive laws that lead to widespread poverty in Ireland distinct from any other country in Europe. Half of the country was dependent on a single crop, the potato, for sustenance, while the fruits of their labor in service to their absent landlords were shipped away to England. When the potato blight struck, the effects were devastating and the news of the horror of the famine spread far and wide. 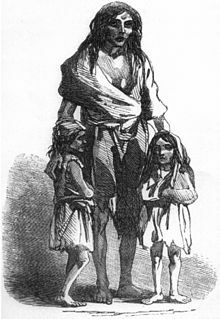 The Choctow native Americans contributed money for the starving in Ireland. This was not the first failure of the potato crop. In the late 1700′s, another failure threatened widespread starvation. But during that crisis, the government ordered the ports closed so that crops and livestock raised in Ireland would be used to ameliorate the conditions of the starving. No such measures were taken in the 1845 famine. During the famine years, the Irish exported more food to England than it received. The landlords’ agents used the famine and loss of rent revenue to throw the tenant farmers off their lands. Their houses were torn down. A new law was passed prohibiting a farmer in possession of more than a quarter acre of land from receiving food relief, to prevent him from getting lazy and too dependent on help. To qualify for food, the farmer had to give up his land. This further exacerbated the problem. Farmers couldn’t plant crops without land and that land reverted back to the landlord to be used as pasture for more lucrative livestock. You can make a donation to Feeding America here. And voile, what do we get from Rick Perry, politician from oil rich Texas? Anyway, Perry is not only stupid, he’s wrong about Social Security. While it’s true that you’ll never get rich on Social Security, it has worked extraordinarily well during the nearly 80 years it has been in existence. The Ponzi scheme is the 401K system that requires workers who participate in it to tie up their money and pay steep penalties to remove it when they might spend it better on paying off their mortgages, and then sit back and watch as the biggest demographic in American history, who were promised all the gold they could eat by their investment fund managers, retires on all that trapped money. It’s almost like when Enron was going down and all the big wigs were cashing in and the rank and file little workers were locked out of their accounts until the stock had been plundered and toppled from a nosebleed high to the dirt beneath their feet? ( And if you really want to know how a Ponzi Scheme works, check out Josh and Chuck’s podcast How Ponzi Schemes Work at How Stuff Works.) That’s not what we have in Social Security. We paid into the system for decades, some lucky workers in the tail end of the baby boom paying extra, so that we would be able to recover our deferred wages when we were ready to retire. Those funds were invested in US Treasury bonds, not some Bernie Madoff character’s initial investors, and, *we*, are creditors to the US, not the other way around. Our Social Security trust fund does not add any debt to the deficit. In fact, it was running a substantial surplus, which we lend to the government, presumably so we can fund states like Alabama and Montana. So, pay up Perry. I guess you could make Americans less dependent on Social Security so that someday, down the road, middle class people could check off a box on their income tax statement that says something like “Your pension and other retirement investments put your family at 200% over the average income for a 67 year old. Would you like to contribute a portion of your social security benefits to another needy senior?”, and if I had the extra money, I might just do that. But for that to happen, you’re going to have to get the tail end baby boomers back to work, contributing their revenue to the bottom line and re-establishing realistic pensions for their years of hard work. But that’s not the Republican way, is it, Mr. Perry? To see what the Republican party really has in store for us, read Goodbye to All That, Reflections of an Operative who left the Cult by former Republican congressional staffer, Mike Lofgren. This post has been circulating the blogosphere for the past couple of days and if you haven’t read it yet, please do so now. This piece might be seen as a one off curiosity, ripe for Republican scorn, if it weren’t followed by similar missives to James Fallows from other staffers that reinforce Lofgren’s confession. As we have long suspected here on The Confluence, the Republicans’ overriding goal is to undermine government and cause people to lose faith in it. The public will be forced to turn to private institutions to take over the functions of government and then those same private companies will have us by the short hairs. This is what anti-tax fanatic Grover Norquist refers to Starving the Beast and making government so small it can be drowned in a bathtub. Oh, you newcomers have never heard those terms before? They’re not new but you can look them up if you don’t believe me. Nevermind that it doesn’t work to create jobs or reduce taxes or, even more naively, stimulate the entrepreneurial spirit (check out the 2nd hour of Virtually Speaking from last Tuesday where Jay has a conversation with a Republican)? Have any of the chipper fiscal conservatives ever tried a one man drug discovery operation in their office park headquarters? 80% of those ventures fail according to the American Chemical Society meeting at Rutgers University in May 2011. Starting a new company on your severance checks and borrowed money from your less than flush family members and then gambling it all on a venture that has an 80% failure rate is something people are forced into. It’s not something they do by choice. And when they fail, they’re going to need Social Security. But nevermind all that. Republicans are just spouting that entrepreneur stuff because they have to put a good spin on their policies, which until we have more data, appear to be grounded in pure, unadulterated greed and selfishness. I’m going to give them the benefit of a doubt and assume they have a beneficent goal in mind because we can’t rule it out. But let’s just say this theory is like evolution. The preponderance of evidence points unambiguously to natural selection but there’s always the teensy, tiny, soupçon of a chance that it was all zapped into being in 6000 years ago by a patriarchal, capricious, vengeful and jealous God just like the Old Testament says. Since we do not know the first cause of the creation of the universe we can ignore all that facty wacty stuff. As I have intimated before, the Republicans are in their endgame now. Between now and next November, they’ve got nothing to lose if they put the pedal to the metal and bully the Democrats into getting everything they ever wanted in their adolescent wet dreams. If they succeed, they will be richly rewarded by their wealthy benefactors whether they are re-elected or not. If they fail, well, it’s only one more 2 year election cycle where the can gum up the works. The public will not be any wiser because if it was, it would vote the Republicans back into oblivion like they did in 1964. It turns out it was the only way to get Medicare past these obstructionist confederates who are still saving their Dixie Cups (A couple of people just laughed and instantly aged themselves). All that’s standing in their way is Brave Brave Brave Barack Obama. He was not at all afraid to veto bills in nasty ways. So, there’s nothing that stands between the Republican juggernaut and their goal. Alienation. As workers were divorced from the output of their labor, Marx claimed, their sense of self-determination dwindled, alienating them from a sense of meaning, purpose, and fulfillment. How’s Marx doing on this score? I’d say quite well: even the most self-proclaimed humane modern workplaces, for all their creature comforts, are bastions of bone-crushing tedium and soul-sucking mediocrity, filled with dreary meetings, dismal tasks, and pointless objectives that are well, just a little bit alienating. If sweating over the font in a PowerPoint deck for the mega-leveraged buyout of a line of designer diapers is the portrait of modern “work,” then call me — and I’d bet most of you — alienated: disengaged, demoralized, unmotivated, uninspired, and about as fulfilled as a stoic Zen Master forced to watch an endless loop of Cowboys and Aliens. False consciousness. According to Marx, one of the most pernicious aspects of industrial age capitalism was that the proles wouldn’t even know they were being exploited — and might even celebrate the very factors behind their exploitation, [you mean like trying not to piss off the omnipotent ‘job creators’?] in a kind of ideological Stockholm Syndrome that concealed and misrepresented the relations of power between classes. How’s Marx doing on this score? You tell me. I’ll merely point out: America’s largest private employer is Walmart. America’s second largest employer is McDonald’s. One of the things I remember studying about the American Revolution was not that we were so adamantly opposed to paying a tax on stamps and tea but *why* we were so opposed to it. If I recall correctly from one of those giant non-fiction tomes we all passed around during Christmas break several years ago, American political thinkers were particularly alarmed by the prospect of becoming just another Ireland to the British. Just one big Plantation where the fruits of our labor would be siphoned off to some other place and we would be forced to pay a hefty price to get them back. It would be a place where we wouldn’t really own anything of our own and be in subjection to the British and their militias forever. Always poor, always dependent. Always on the brink of starvation. Ireland was not the only country with serious money problems. In the fall of 1847, Great Britain experienced a crash due to bad investments by English speculators and the resulting impact on London’s banks. Wheat and corn prices had skyrocketed in 1846 throughout Europe only to tumble by the middle of 1847 when supply far exceeded demand. British investors that speculated took huge losses. At the same time, investors speculating in the topsy-turvy British railway industry were ruined as railway shares collapsed. Money became very tight as British banks refused further credit. Eleven banks failed outright. Over a hundred established business firms went bankrupt. Stock prices and commodities tumbled. The British financial crisis meant there would be no money available to help Ireland during its greatest time of need. British officials, greatly preoccupied with their own domestic troubles, would now pay little attention to Ireland. However, there was one exception. Charles Trevelyan remained deeply interested in relief operations in Ireland and quite determined to enforce the Poor Law Extension Act. The British wanted to make the idea of getting a free handout as unattractive as possible to able-bodied Irishmen, fearing they would overwhelm the inadequate relief system, especially in the hard-pressed areas of southwest Ireland. The new Poor Law thus designated workhouses as the only places where able-bodied men could obtain relief, but only after surrendering all other means of support. Anyone holding over a quarter-acre of land was required to forfeit their land before seeking relief. As a result, countless farm families with small holdings were forced into a life-and-death decision over whether to stay on their land and possibly starve or to give up their farm, surrender their dignity, and head for the workhouse as destitute paupers. Workhouses were sparse in remote areas of Ireland and those that existed there were already occupied by widows, children, and the elderly. Trevelyan’s idea was for these people to be ejected from the workhouses to make way for the men. But many local officials in Ireland were unwilling to do this. To organize relief in Ireland, the British had divided the country into 130 separate areas (unions) with several parishes combined together to form a union. Each union was run by a Board of Guardians consisting of Irishmen responsible for setting local tax rates and collecting the revenue needed to provide aid to the people living within the union. But the plan encountered problems from the start due to the sheer size of most of the unions (100,000 or more acres) combined with the ever-increasing shortage of property owners financially able to pay taxes, especially in the hardest hit rural districts. Wherever they were most needed, workhouses quickly slid into debt, ran short of supplies and turned people away in droves. Families in desolate areas resorted to living in small hovels cut out of the bog or dirt holes dug along the hillside. 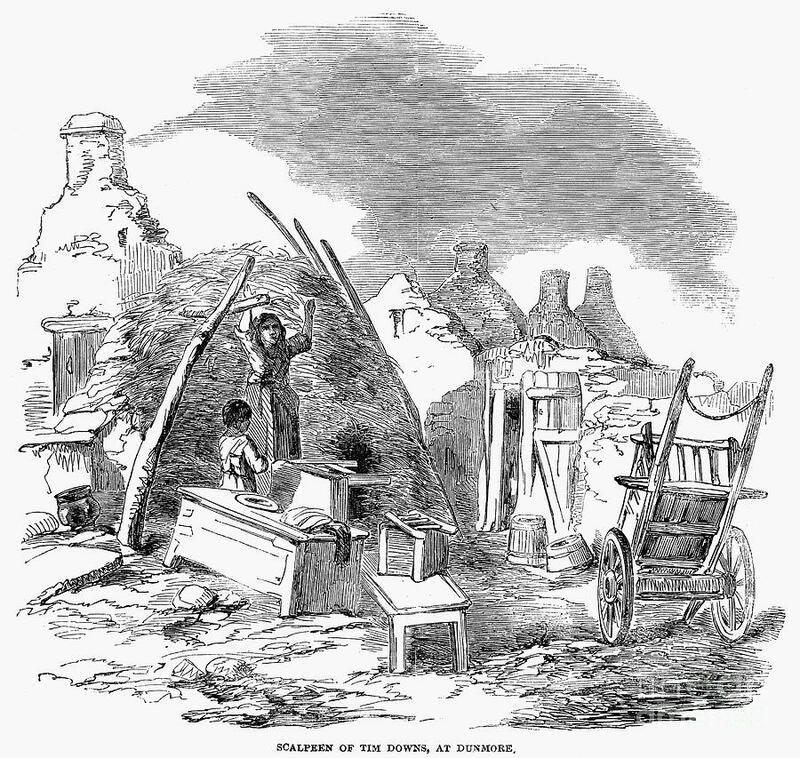 In Donegal Union, ten thousand persons were found living “in a state of degradation and filth which it is difficult to believe the most barbarous nations ever exceeded,” according to the Quaker, William Forster. His organization, the Society of Friends, had refused to work in cooperation with the new Poor Law. Would the government let the landlords turn us out? Are you kidding me? Here’s the ting, no one loves you better than you love yourself. Don’t expect the Republicans to grow a heart in the next 13 months. Don’t expect the Democrats to grow a spine either. 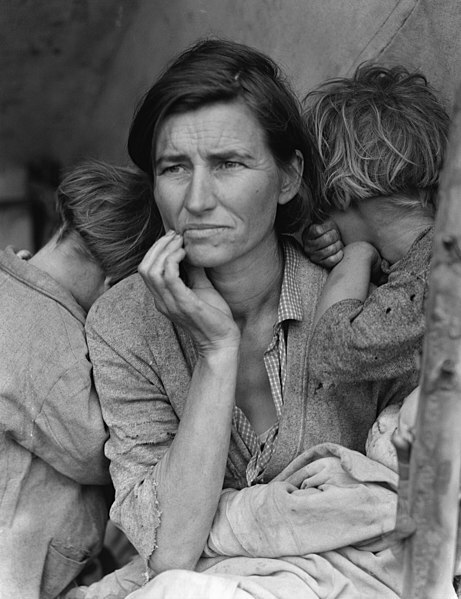 We as a country have already been through one Great Depression and paid dearly in order to put the country back on its feet. Now we have Rick Perry, a Mitt Romney and Barack Obama and the craven media and the well connected and clueless pundits who are ready any second now to turn us all into the peapicker’s wife and her children. Would they care if you die because you have no health insurance, food, a roof over your head or money to live on when you’re old? Heck, they don’t know you personally. If you’re not making a couple million at bonus time, you’re just a parasite to them. Better to die and decrease the surplus population. Or go fricasee a tot. Get with the program. This is the Republican’s vision of the future covered in a sickly sweet oleaginous whipped cream over American apple pie and motherhood. Speaking of the future, the Freedom Tower is rising over the remains of the World Trade Center. Can I just say that I really despise the name “Freedom Tower”? Everytime I hear it, I think of George Bush, My Pet Goat in hand and “deer in the headlights” look on his face, swaggering onto The Pile a few days later acting like he’s a hero and throwing that precious word around carelessly as his VP sections off oil fields on a map of Iraq in the Situation Room. Can we call it Memorial Tower? Or Remembrance Tower? Or Port Authority Tower? Something like that? Why do we have to continue to engage in hucksterism and propaganda? What freedom did we get from 9/11? The freedom to take off our shoes and have our modest adolescent children scanned naked in an airport? The freedom to have our phones tapped indiscriminantly? The freedom to live in a police state with our children shut up behind locked security doors at school and video monitors tracing our every move? The freedom to be held as an enemy combatant indefinitely and without habeas corpus merely on the word of some unknown accuser? We reacted with anaphylaxis to a horrific event. We adapted poorly. It’s just a building and I’m glad it’s going up to fill the gaping hole in the sky. But let’s not forget what it really stands for. It was a very bad day that lead to a very bad decade. How about Havewelearnedanything Tower?